You are here: Home / All blog posts / Chocolates in spaaaaaace!! Next post: Off to Complex Weavers Seminars! I was all set to build one of my own, but then I realized I could do something much, much cooler. The launch of SkySat-2 is coming up fast, and obviously something needs to be done to mark the occasion! And what better way to improve a launch party than to make your own chocolate satellite? So I am working on a rendition of SkySat-2 – in chocolate. As you can see, it’s a rectangular box with solar panels on the sides, and a door that opens with a saucer and gold doohickey sticking up from the saucer. That is relatively simple to build. The only tricky part is supporting the open door on the satellite. I will probably tip it over onto its side, which will allow the door to be supported by whatever goes underneath the satellite. (Most likely an 18″ x 24″ baking sheet, but possibly something more rigid, like a sheet of marble.) I’ll still have to buttress the back of the door, but that should be fairly easy. 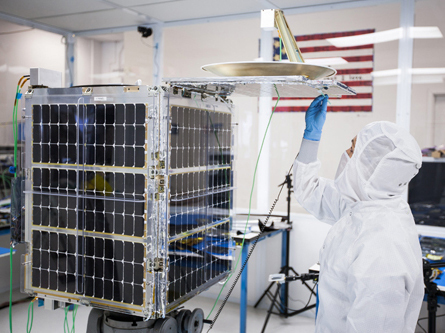 I am, of course, full of ideas for decorating the satellite – I want to put a Skybox logo onto the side in Google colors, and I have some other cool ideas for making the solar panels. I’ve ordered some supplies, including 46 lbs of chocolate, and will be prototyping some of the decoration ideas later today, once Mike gets up and I can use the tempering machine. I’m also going to take another stab at making my own chocolate transfer sheets – I want five or six sheets with the Skybox logo on them, as I’m thinking of making some chocolates to accompany the satellite. That is an “extra”, though – I’ll only do it if I have time and if I can screen print the acetates successfully. I’m not really bullish on my prospects since I wasn’t terribly successful last time around, but it’s worth trying. Of course, I also have twelve pounds of cherries and three pounds of rhubarb to convert into jam, so I can’t simply play with chocolate all day. But that’s OK – I’m mostly testing techniques right now. The bulk of the work will be done over the July 4 holiday weekend, when I am praying it will be cool enough to work with chocolate. Off to do more satellite sketches! This is a really cool project and I’m excited to be working on it.